Next, you're going to disagree with the Archbishop of Canterbury on the Church of England's policies and the Prime Minister on government positions? I’m a gay Catholic member of the Labour Party. Do you really want to open that can of worms? You're either trolling or just really slow. Frankly I can disagree with anyone I want. If the government’s position is wrong - I’m entitled to disagree with it. Same as I can the CoE. I really think you need to consider your words more carefully as you’re getting lost in your own argument here. But this is the British Royal Family thread - it’s not about you, me or whatever we think. It always makes me smile seeing them together. We are so in need of just good news stories these days. If you want to move on, you would have accepted the fact that you hold the incorrect opinion and at least learn to stay quiet. But you didn't, because you're so deluded to think that your opinion trumps that of the Lord Chamberlain's on who is a member of the royal family. I didn't get lost in my own argument, and your random, baseless assertion will not change that. You're right - who's a member of the royal family is not about what I think, that's why I gave you the official list of royal family members. By your logic, I can say "I like oysters", and you can say "I'm entitled to disagree with whether you like oysters, no, you don't like oysters no matter what you think you like". Guess what? You are indeed entitled to hold wrong opinions, but that doesn't shelter you from getting criticized and corrected in public everytime you insist on being wrong. Ah well, you see there is your issue. You rely too heavily on what you have googled to learn, rather than what you already know to be truth. Which of course is why I moved the conversation forward, but you seem to repeatedly want to continue down this line of conversation. As I have previously said, there is a world of difference between ‘The Royal Family’ and those that belong to the ‘Mountbatten-Windsor Family’ (aka The Queen’s extended family). Should you chose to believe they are one and the same, then so be it - I have not one ounce of concern. However I accept your confusion as ‘The Royal Family’ term is used interchangeably and often quite incorrectly. But the entire truth is that only Royalty can be Royal and to be Royalty you must have a Royal title. It is quite simply as straight forward as that. As it stands, Prince Henry’s child has no legal right to become a prince of princess at the time of birth. I fully agree that The Queen will make them one, but until she does, they will not be Royal. Now there is no sense in continuing this line of discussion - this is a news thread, and I’d prefer it to remain as such. It’s bad enough there’s been lizard talk on recent pages. If you want to discuss further, feel free to PM me. Ah well, you see there is your issue. You rely too heavily on what you have googled to learn, rather than what you already know to be truth. You see, that is your issue. You have dictated that your opinions must be facts, and no matter how much evidence there is, you are not going to think you might be wrong. Which of course is why I moved the conversation forward, but you seem to repeatedly want to continue down this line of conversation. You didn't move the conversation forward. In the beginning, you held your wrong opinion; now, you are still holding your clearly wrong opinion, with absolutely no new evidence or argument added. 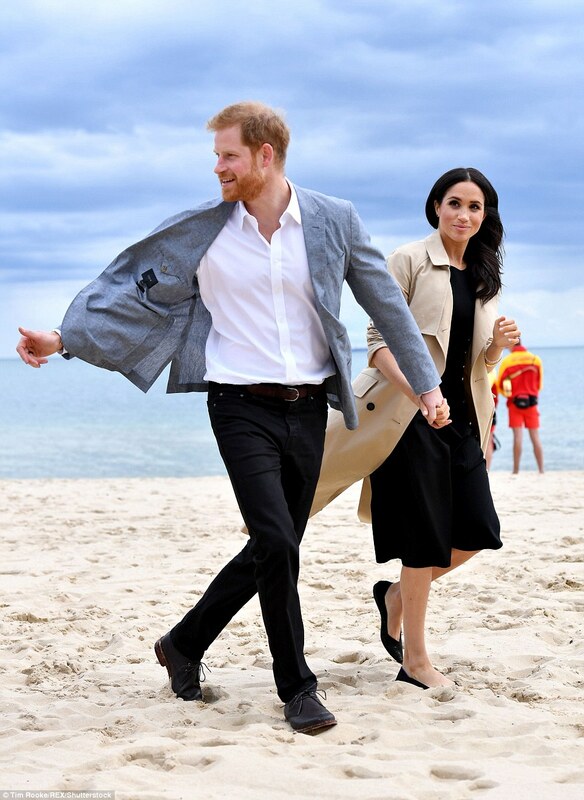 As I have previously said, there is a world of difference between ‘The Royal Family’ and those that belong to the ‘Mountbatten-Windsor Family’ (aka The Queen’s extended family). 17 people without a princely title are officially considered a part of "the royal family". Should you chose to believe they are one and the same, then so be it - I have not one ounce of concern. However I accept your confusion as ‘The Royal Family’ term is used interchangeably and often quite incorrectly. Incorrectly? Who are you? Oxford Dictionary or are you the sovereign? Neither? Then what qualifies you to be the judge on that, as opposed to the actual head of the royal family deciding who is a part of the royal family? and to be Royalty you must have a Royal title. Wrong. Not according to the royals themselves, and the sovereign; not according to how the word is used in real life either. So you hold a view that is contradictory to whether you see the term as prescriptive or descriptive. It is quite simply as straight forward as that. Must like your incorrect use of the word "straightforward", your opinion is just flat out, obviously, incorrect, for all the reasons mentioned above and prior to this. As it stands, Prince Henry’s child has no legal right to become a prince of princess at the time of birth. I fully agree that The Queen will make them one, but until she does, they will not be Royal. I already told you that's a moot point as the baby will more than likely survive The Queen, thus gaining the title automatically. Also you: "Nah not without saying how right I am because I'm God or something"
You: "This should be a conversation done via PM"
Also you: "Well, ONLY for people who are not me. I can continue posting here because I decide everything"
You were embarrassing before, now you're just pathetic. "The baby will not be royal because they will not get a princely title"
"The baby will not be royal because they are not going to be a member of the royal family"
What you saying essentially is that "the baby will not be royal no matter what The Queen says, because I have decreed that they will not a member of the royal family in the beginning and cannot accept to admit being wrong". Interesting fact: Queen Elizabeth is still the queen of 10 sovereign states in America. That bish is just a puppet. Lizard people tend to be a bit behind the times, I'm afraid. But the Head of the Commonwealth of Nations did praise Switchboard and honorary fellow Rector Stephen Fry claimed that the Supreme Governor of The Church of England had this to say when the Crown passed gay marriage into law in England, Wales, and Scotland, "Well, who’d have thought 62 years ago when I came to the throne, I’d be signing something like this? Isn’t it wonderful?”. Our King and Queen visiting the UK. 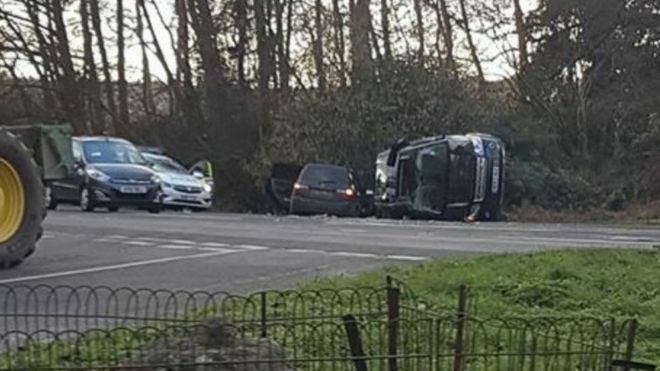 Prince Philip, 97, was not injured in the accident, which happened as he drove a Land Rover out of a driveway onto the A149 shortly before 15:00 GMT. The other car involved was a Kia. Two women in it needed hospital treatment - they have since been discharged. Eyewitnesses said the duke's Land Rover overturned during the collision. A woman who drove past the crash scene - near Babingley, a small village north of Kings Lynn in Norfolk - at around 15:40 said she saw an ambulance and "a heavy police presence". "I was just going down the A149 … and saw a lot of blue flashing lights ahead," she said. "I saw a black, 4x4 type car on its side and me and my son were like 'oh my word, that doesn't look good'. The driver of the Kia suffered cuts, while the passenger sustained an arm injury, police said. Both were treated at the Queen Elizabeth Hospital in King's Lynn. A statement said the road remained open and both vehicles were recovered a short time later. "The [Land Rover] was on its side on a private road. "The other car was well into the hedge on the opposite side of the road. "There was lots of debris in the road, lots of glass and lots of other cars, some police cars, some from the Sandringham Estate and about six ordinary looking cars that looked as though they had stopped to help. I wonder what the officers would've done had the Queen's husband been over the limit. Pleased His Royal Highness is uninjured and safe. Why is he driving? I’d like the UK to follow other countries in making people above a certain age take another driving test of sorts. Obviously we don’t know if it was his fault, but it’s a known fact that older people have slower reactions and I don’t think it’s harsh to get them to test for things like eyesight, hearing, reaction speed etc. Anyway surprised he was driving anyway, thought he was incredibly ill. He shouldn't be driving a car at that age. It gave me flashbacks of the Princess Di car crash! And yet you both felt the need to comment?